Strategic planning, sourcing, and implementation of safety and risk management operations are multi-dimensional activities that require consideration of a multitude of factors. Compliance, quality, and efficiency of safety processes being outsourced is a basic expectation now for more tactical areas of pharmacovigilance (PV) such as call center and case processing due to the maturity of the outsourcing and offshoring environment and processes. 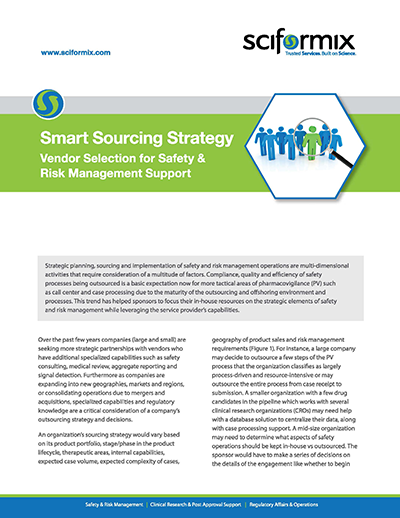 This trend has helped sponsors to focus their in-house resources on the strategic elements of safety and risk management while leveraging the service provider’s capabilities.